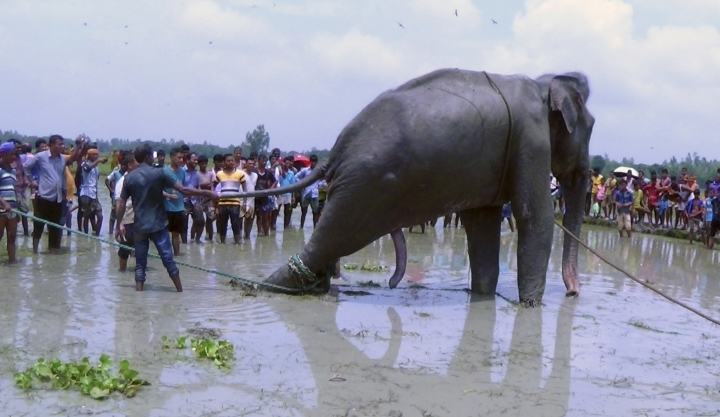 NEW DELHI — A fully grown Indian elephant that washed up in a swamp in Bangladesh after being caught up in raging floodwaters has become a jumbo problem for wildlife officials on both sides of the border. Floodwaters from monsoon rains carried the male elephant thousands of kilometers (miles) from upstream India before he became trapped in a swamp in Bangladesh's Jamalpur district some three weeks ago. Tapan Kumar Dey, a retired forest conservator who was overseeing the rescue efforts, said wildlife workers tranquilized the elephant Sunday to bring him closer to a highway to truck it to a safari park outside Dhaka, Bangladesh's capital. Indian wildlife authorities abandoned a plan to send the elephant back to India because he was unlikely to be welcomed by his herd in the hilly forests of the remote northeastern state of Assam. They then agreed to let him be transferred to the park. Dey said wildlife experts were experimenting with tranquilization dosages because they wanted to make the transfer to the truck go smoothly. The swampy area where the elephant, whose age was not clear, was found was a few kilometers (miles) from the highway. Forest guards and wardens used smaller doses of the tranquilizer and chains and iron hooks to get the elephant to start moving, Dey said. Wildlife authorities plan to use at least two domesticated elephants to help lead the way. "We plan to use some elephants to encourage it to walk with them toward the main highway," Dey said. The elephant appeared to be in good condition, although when forest guards found him, he was dehydrated after being stuck in the swamp for days, Dey said. "Now our challenge is to bring it to the main highway, which is a few kilometers away," he said. "From there, we will take it to the safari park on Monday." Indian wildlife experts had visited the scene and agreed with Bangladesh's proposal to transfer the elephant to the Bangabandhu Safari Park, 50 kilometers (32 miles) north of Dhaka. But another problem that wildlife wardens were facing was controlling the hundreds of people who have gathered to watch the rescue efforts, Dey said. Local villagers have named the elephant "Bangabahadur," or "Hero of Bengal." Security officials had to be deployed Saturday and Sunday to hold back curious villagers and keep them from hooting and cheering, which could disturb the elephant. Heavy downpours have flooded vast swaths of eastern India since monsoon rains began in June.